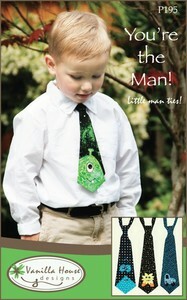 Fabulous little boys ties! Tons of combinations, skinny, medium width and wider tie. four ways to connect the back, (snaps, hook & loop, elastic or plain tie-on), and four motifs, (Alien, Crazy Bird, Speedy and Hairy) Best of all- a completely no-sew version! Fits little boys 6 months to 4 years.